The Harder They Fall. UConn (-4), Ohio St. (-8), Gonzaga (-8) and Xavier (-4) took big hits this week (and Gonzaga is due to take another). Georgetown (+3) made the biggest jump by virtue of its manhandling of UConn on Monday night, although several other teams had +3 jumps in the middle of the pack as well. Variance. Baylor and Memphis, with Ohio St. and Syracuse following, are the four teams that the bloggers had the most trouble agreeing on. 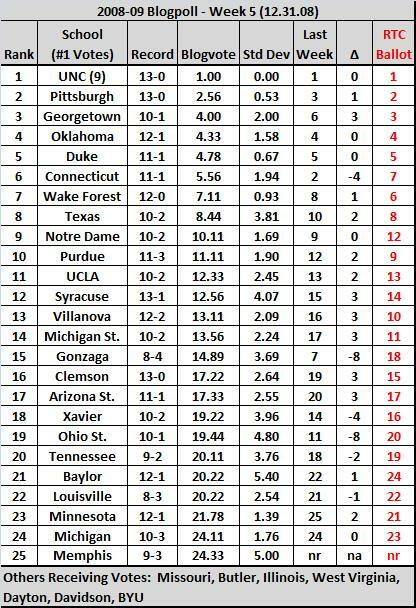 Baylor, for example, was rated between 9 to 24, and OSU ranged from 10 to 24. Memphis was rated #11 by one blogger but unranked by everyone else. The bloggers votes are tallied here. Conference Call. Big East (7), Big 10 (5), ACC (4), Big 12 (3), Pac-10 (2), A10 (1), CUSA (1), SEC (1), WCC (1). This entry was posted on Thursday, January 1st, 2009 at 3:02 pm by rtmsf	and is filed under blogpoll. Tagged: acc, atlantic 10, baylor, big 10, big 12, big 123, big east, blogpoll, conference usa, connecticut, georgetown, gonzaga, memphis, ohio st, pac-10, sec, syracuse, wcc, xavier. You can follow any responses to this entry through the RSS 2.0 feed. You can leave a response, or trackback from your own site.